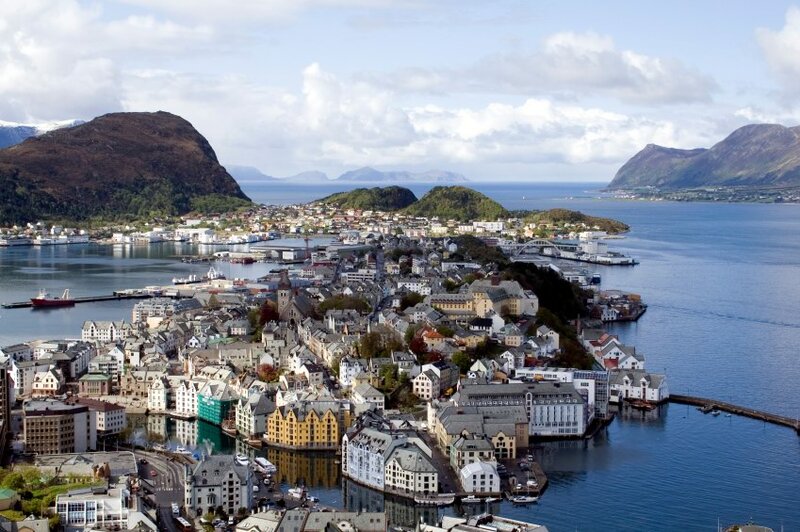 In the spectacular fjord country of Aalesund, Norway, 240 mi/385 km northwest of Oslo on the coast between Bergen and Trondheim, lies a fishing center of about 40,000 people that covers three islands and is worth a visit to see its art-nouveau architecture. Nearby sights include the "bird island" of Runde (220 species and more than 500,000 nesting birds have been spotted there) and Selje Monastery (eerie medieval ruins on a wild, beautiful island). Visit the national Art Nouveau Center to learn more about the city's architecture. http://www.jugendstilsenteret.no. We were also impressed by Vestkapp, a cape so stormy that the Vikings dragged their ships overland to avoid it. In the coastal region of Sunnmore, be sure to see Atlantic Sea Park, one of the largest aquariums in Scandinavia. http://www.atlanterhavsparken.no. At the Kraakenes Fyr lighthouse, you can stop for coffee and waffles—or even stay the night. http://www.krakenesfyr.no.